Fujairah, an Emirate located on the east coast of the United Arab Emirates is a fusion of tropical waters, desert sand and sunshine galore! There has been a steady increase in tourism over the years because of the region’s exotic underwater world with its sparkling waters, bright coral reefs, and fascinating marine life. Sea turtles that travel thousands of miles each year make their presence felt in the waters of Fujairah. 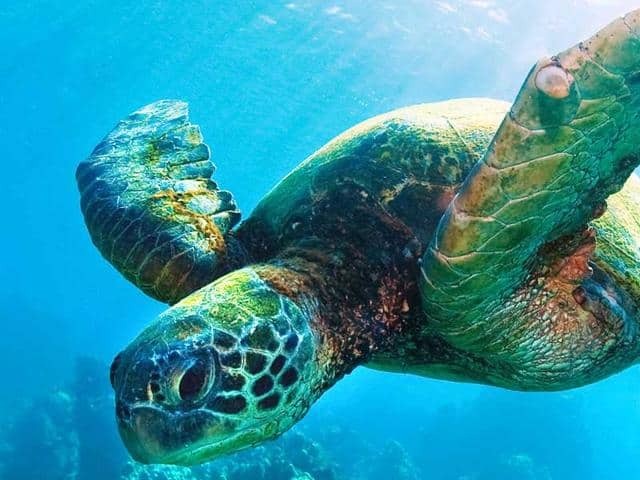 In recent years, the population of sea turtles in the area has begun bouncing back, thanks in part to rising environmental awareness as more people are becoming conscious of their actions and realizing that we all share in the responsibility of taking care of Mother Earth. Sea turtles happen to be one of the most commonly recognized threatened animals and Nemo Diving Center supports the global initiative of protecting turtles; in fact, our divers saved a sea turtle entangled in fishing lines just last month at Dibba Rock, Fujairah. It’s good to know that people’s collective gestures to help the environment are helping the population of turtles like the Hawksbill and Green turtles rise again in these waters. The best way to interact with these beautiful animals in their natural habitat is to observe them from a few feet away because close proximity can cause them stress. This goes without saying that you should not touch or feed them in the wild. Different shark species also patrol the waters of Fujairah and one of them is the blacktip reef sharks which get its name from the black tips on its fins and pointed snout. Although the population of blacktip reef sharks has declined over the past two decades because of pollution, overfishing, and partial habitat destruction due to coastal developments along the Gulf of Oman and Arabian Gulf, these sharks can be still be spotted in the shallow waters particularly off Dibba Rock on the east coast. In January 2018, Fernando Reis, founder of The Sharks Educational Institute reported a total of 25 sightings of blacktip reef sharks with as many as ten sharks at a time during their four dives in Dibba. Other possible sharks that may be seen in Fujairah are hammerheads, lemon sharks, sandbar sharks, nurse sharks, and more. 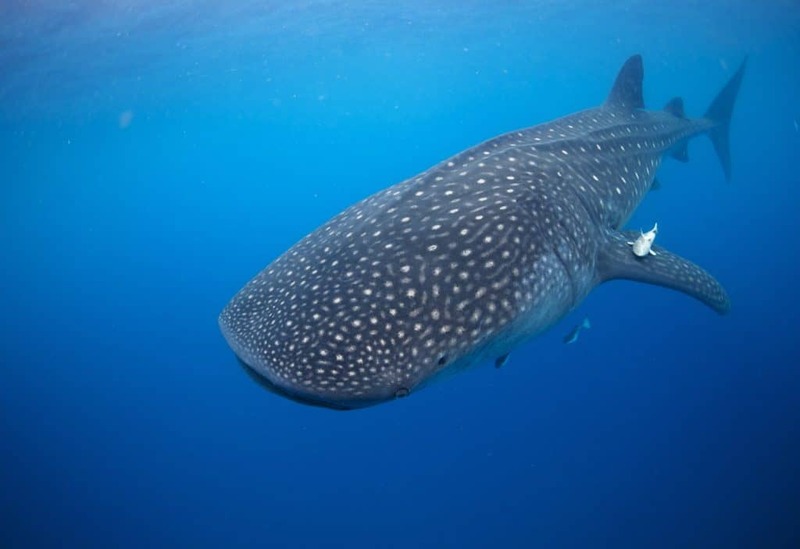 Whale sharks are no strangers to UAE waters and in recent years, scuba divers have occasionally encountered these gentle giants swimming off the coast of Dibba. These majestic animals can measure up to 40 feet or more in length and weigh as much as 20.6 tons but despite their size, these plankton-eaters are harmless to humans. Swimming with these massive yet docile creatures can be a thrilling experience but we should not lose sight that they are wild animals which deserve our care and respect. Interacting with these creatures involves certain responsibilities like not wearing sunscreen and other chemicals and staying at least 3-4 meters away from them during your encounter. Don’t be surprised if you see dolphins during your trip in the region. In April 2018, a group of scientists spotted a pod of rough-toothed dolphins traversing off the coast of Fujairah during an aerial survey. Thanks to modern technology, it is now easier to capture a new vantage point of the world we live in, exposing the beauty of nature from high above. The discovery of the rough-spotted dolphins some 40 miles east of Fujairah Port was added to the list of new records of UAE according to Robert Baldwin, a marine scientist and managing director of Five Oceans. The said organization is responsible for mapping the marine diversity in the East-coast emirate in collaboration with Al Mayya Sanctuary. 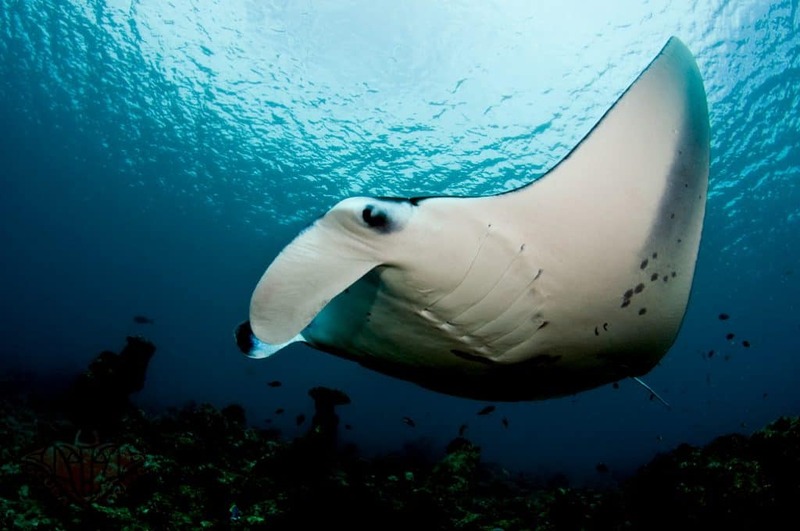 Rays such as manta rays, devils rays, and spotted eagle rays may also be seen gliding in the region’s waters. Fun fact, rays have wide, flat bodies that hardly resemble a fish but did you know that they are actually fish? Rays are related to sharks and like their kin, they do not have bones in their bodies; instead, they have cartilage for support. They have broad fins around their bodies which give them a round shape and some of them move their whole bodies to push themselves through the water. By nature, stingrays are docile creatures but for your own safety, it’s best to keep a good distance while swimming with them because they are easily startled. Fascinating as they seem, you should not swim directly over one because the creature might feel threatened and go on defense mode. Starfish, also called Sea Stars, is one of the most stunning creatures in the ocean and you’ll find a lot of them in Fujairah. These unique marine animals come in various shapes, colors, sizes, and have hundreds of tiny little feet at the end of each arm. Although starfish are small and slow, they act as predators that help set a balance in the ecosystem. However, Fujairah has its share of troublesome starfish species like the coral-killing starfish called the Crown-of-Thorns (COT). When these species wrap its stomach around the coral, it digests it on the spot and the coral eventually dies, leaving only the white skeleton behind. If there is an outbreak of this species of starfish, the corals might suffer. 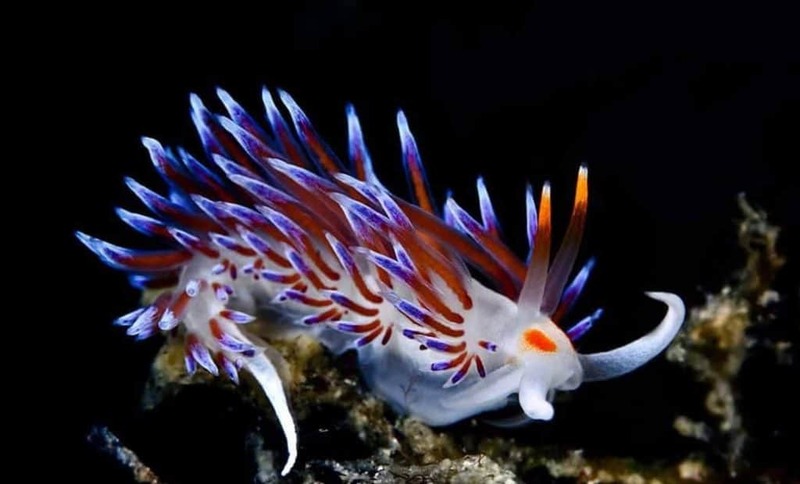 Another fascinating small creature that inhabits these waters is the nudibranch, which comes from Latin and Greek words meaning naked gills. Nudibranchs come in different color variations and their so-called naked gills make them more stunning like a wildflower in the water. 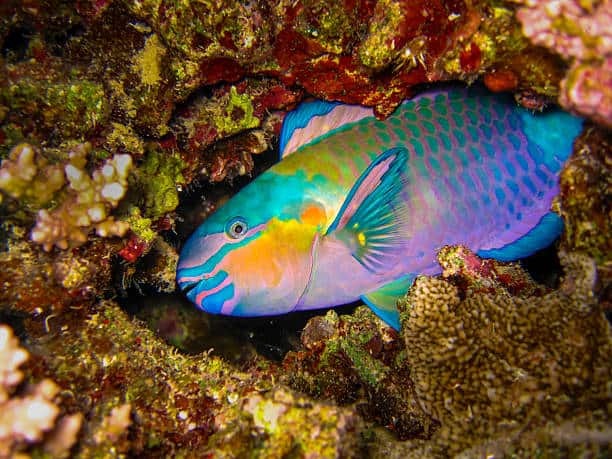 Many underwater photographers love using them as their subjects because of their captivating beauty. Seahorses which are known to thrive in temperate coastal waters can also be seen in the area and underwater photographers are also mesmerized by them. Although seahorses are native in UAE waters and protected in their home turf, their population is not as desirable as it used to be because they arehighly sensitive to pollution, climate change, and human-related disturbances. In an effort to create a new colony of seahorses to increase the number of native seahorses in UAE waters, Dennis Blom, manager of the Lost Chambers at Atlantis released 50 rare newborn seahorses into the wild back in 2012. Fujairah is a haven for tropical fish and they fill the waters with colorful activity. Some of the notable fish seen in these parts are the butterflyfish, parrotfish, wrasse, longfin bannerfish, bowmouth guitarfish, hawkfish, cornetfish, grouper, and more. The coral reefs off Fujairah Coast is home to countless fish and many other marine creatures but a three-year study concluded that regional coastal development is causing the rapid decline of coral in the region which is pushing agencies to draw up possible conservation plans. In June 2018, the UAE’s Ministry of Climate Change and Environment (MOCCAE) and the Fujairah Centre for Adventures signed a memorandum of understanding (MoU) to build the Guinness World Record-breaking coral garden in Fujairah. This project is expected to be the largest of its kind in the world which aims to get the support of local and international sectors to protect the marine environment. A final location for the coral garden and project timeline have not yet been disclosed. All these forms of marine life may sound interesting but nothing beats seeing them with your own eyes. What are you waiting for? Book a dive trip in Fujairah now and discover the real beauty of underwater creatures.